Most of Telluride was designated a National Historic Landmark District in 1961 because of Telluride’s role as a frontier town and precious metals mining district and its “19th century western mining ‘boom town'” architecture. The district covers several residential neighborhoods, a commercial street, a warehouse area, and a bordello district. There are 305 historic buildings, including 160 single-family homes, 16 business/retail establishments, three hotels, six saloons, four warehouses, three social/fraternal halls, two multiple-family dwellings, two banks, two schools, two hospitals, two churches, a rectory, a courthouse, a jail, a train depot, and a theater. Telluride’s layout was typical for a Colorado mining camp. A commercial street ran through the middle of the town, with schools, churches, hospitals, and finer homes on uphill streets while saloons, gambling halls, bordellos, warehouses, the railroad depot, and cheaper housing were on the streets running downhill toward the river. The town is best explored on foot, and this walking tour will start and end on Colorado Avenue, which is Telluride’s main street. We will begin at Colorado Avenue and Townsend Street on Telluride’s west end, and the first stage of the tour will go through what was the working class part of town in the late 1800s. Start by walking south from Colorado on Townsend for two blocks to the Rio Grande Southern Railroad Depot building, 300 S. Townsend St., which was built in 1891 and was surrounded by boardinghouses and warehouses. Behind the depot is the San Miguel River, and there is a dirt trail that follows the river for the length of Telluride. Head back up Townsend for a block to Pacific Avenue and take a look at the building on the southeast corner of Townsend and Pacific that now houses the Elks Lodge. It was built in 1899 as Swede Finn Hall to serve the Scandinavian miners who lived in “Finn Town” on the south side of Pacific. Next door is the larger Finn Hall, built in 1902. Continue east on Pacific and you will find Finn Town Flats, a former boarding house marked by a historic plaque. Once you reach Oak Street, look north to 122 S. Oak, which is the former Dahl House, a miner’s rooming house built in the 1890s, now a restaurant. Continue walking east on Pacific past Fir and Pine streets, and you’ll enter “Popcorn Alley,” as the bordello district was known. The three small buildings on the north side at 121, 123 and 125/127 E. Pacific were built in the 1890s and served as cribs for prostitutes. The first two have just two rooms, while the third is a duplex. The bordellos are rare because cribs typically were among the first buildings torn down as mining towns were revitalized; these buildings were preserved by the National Trust for Historic Preservation in the 1970s. Imagine this area packed with cribs, saloons, gambling houses and dancehalls in Telluride’s in the late 1800s and early 1900s. Three other buildings in this area are worth noting. Appropriately for a red-light district, the first is the Old Town Jail at the corner of Pacific Avenue and Spruce Street. The stone building was erected between 1900 and 1904. The second is a gambling house just north of Pacific at 123 Spruce St. that was called the Senate and was built between 1894 and 1899. The third is the Pick & Gad Building, 220 S. Pine St., which was built in the 1890s and served as a “parlour house,” serving featured food, drink and music for the night as well as women and gambling. From Pacific, turn north on Willow Street, walk to Colorado Avenue, and cross to the north side. Note how wide Colorado is for a town founded in 1878 and how much wider it is than the town’s other streets. The reason is that Telluride was so remote before the railroad arrived in 1891 that gold ore had to be taken by burro over Imogene Pass to Ouray, then by ox to Alamosa and finally by train to Denver. Colorado Avenue was built wide enough for a train of six to eight burros loaded with ore could turn around. • The Roma Bar Building at 135 E. Colorado Ave. was erected before 1890 and retains the wooden storefront of that time, though it but has been remodeled and now is used by a restaurant. Downstairs, there is an 1860 Brunswick-Balke-Collener Co. bar of carved walnut backed by 12-foot-high French mirrors. • The Mahr Building at 129 W. Colorado Ave. was erected in 1892 on the site of the San Miguel Valley Bank, where Butch Cassidy staged his first bank robbery in 1889 at the age of 23. Before that, Cassidy was just a horse thief. He and his three associates got away with $24,580. The bank building later burned down. • The Nugget Building, 201 W.Colorado Ave., was originally called the First National Bank Building when it was built in 1892 by L.L. Nunn, a lawyer, banker, and entrepreneur, to house the bank and the Telluride Power Co., which Nunn created to sell electricity from the world’s first commercial-grade alternating-current power plant in nearby Ames. The Nugget Building is in Romanesque style with native red sandstone and imported red granite columns. The building originally had a tower at the corner, which is visible in historic photos, but the tower was removed because of concerns of structural problems. • The New Sheridan Hotel, 231 W. Colorado Ave., was built in 1895, and its Continental Room had 16 velvet-curtained booths that were equipped with phones so that diners could call for service and minimize interruptions from waiters. The Sheridan Bar’s is made of cherry wood and was imported from Austria. The famed orator William Jennings Bryan delivered a reprise of his famous “Cross of Gold” speech on a platform in front of the Sheridan in 1904. • The Sheridan Opera House is next door at 110 N. Oak St., with its trademark “Show” sign on the building’s exterior. The building was the brainchild of J.A. 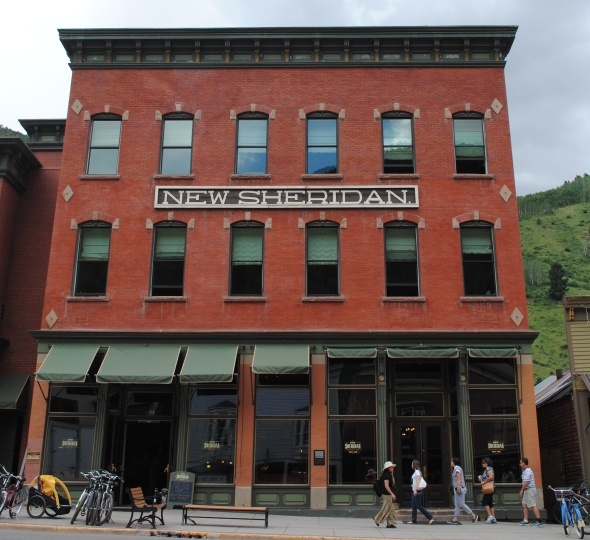 Segerberg, a manager of the New Sheridan Hotel, who saw a potential for a theater in Telluride. The Segerberg Opera House opened in 1913 as a 236-seat vaudeville theater and cultural center and drew performers such as the actresses Lillian Gish and Sarah Bernhardt. The theater was later renamed to reflect its connection with the hotel next door and was saved from demolition in 1991 by the nonprofit Sheridan Arts Foundation, which owns and operates it today. • The San Miguel County Courthouse, 305 W. Colorado Ave., was built in 1887 of red bricks salvaged from an earlier courthouse that burned down across the street. The three-story tower and arched windows are Italinate in style, and the courthouse is still used today. On the grounds is one of the “Galloping Goose” railroad cars that originally transported freight, passengers, and the U.S. mail as the Rio Grande Southern Railroad scaled back its operations during the Great Depression. This car features a Wayne bus body that replaced the original Pierce-Arrow car body in 1945 and was reconfigured in 1950 to carry 20 tourists, a service that ended in 1952. The angled metal snout plowed snow off the tracks. For the third stage of our walking tour, continue down Colorado Avenue to Aspen Street and then walk north one block to Columbia Avenue. Here, we will begin a tour of what was the more prosperous part of Telluride in the late 1800s and early 1900s. Walk a half block west on Columbia to the two-story Telluride Elementary School, 447 W. Columbia Ave. The original building was constructed in 1895 with local bricks, only to collapse, and then was rebuilt a year later at a cost of $24,000 with imported bricks. The first teachers were paid $80 a month. The belfry and bell were added in 1902, along with a four-room addition to the original eight-room building, at a cost of $17,000. Return to the northwest corner of Columbia and Aspen for the L.L. Nunn House, a large, Victorian-style, two-story home built in 1887 for the lawyer, banker, and entrepreneur responsible for the First National Bank and the Telluride Power Co. A smaller, two-story Victorian next door at 427 W. Columbia Ave., was bought by Nunn for his Telluride Institute and housed engineers he brought from Cornell University to learn about the production of electric power. It dates back to 1891. Both are now private residences. A block east on Columbia is a large, two-story brick home built in 1894 at 207 N. Oak St. by E.L. Davis, a mining and real estate entrepreneur who owned the Mayflower, Nellie, and Etta gold mines, the land where the railroad depot stands, and a one-third interest in west Telluride. He also served as president of the Telluride Board of Trade, which promoted the town. The Davis home was used as a hospital during the 1918 flu epidemic, which killed one in 10 Telluride residents, and is now a private residence. From there, walk a block east on Columbia to Fir and two blocks north to the end of Fir, where you’ll find the Telluride Historical Museum in the former Hall’s Hospital. From the museum, head south for a block and west for a block to the home of banker Charles Waggoner, who was a hero to Telluride residents during the stock market crash in 1929. The home is on the southwest corner of Galena Avenue and Pine Street. Waggoner, as president of the Bank of Telluride, used a complex series of illegal transactions to pay off his bank’s $500,000 in debts at the expense of six New York banks before regulators shut down his bank. “I would rather see the New York banks lose money than the people of Telluride, most of whom have worked all their lives for the savings that were deposited in my bank,” Waggoner testified. He was convicted and sentenced to 15 years in prison. Then walk a block east on Galena to the St. Patrick’s Catholic Church, 301 N. Spruce St. The church was built in 1896 in the Gothic Revival style at a cost of $4,800 and features wooden figures of the Stations of the Cross that were imported from Austria. Also located here are the original rectory and parish house, also built in 1896. Walk down Spruce to Columbia, then two blocks west on Columbia to Fir Street. On the northeast corner is the Town Hall, 135 W. Columbia Ave. It was built in 1883 as Telluride’s first schoolhouse for a cost of $3,000 but was taken over by the town after Telluride Elementary opened in 1896. The tower for drying fire hoses was added in 1896. Across Fir Street is the brick, two-story Miner’s Union Hospital Building, 107 W. Columbia Ave., which was built in 1902 by the Western Federation of Miners to serve the union’s members. It closed two years later as the union conceded defeat in its organizing efforts in Telluride’s mines and mills after a series of reversals and the forcible removal of union miners by the National Guard on the orders of the governor. For the final stop on the tour, walk south on Pine Street to Colorado Avenue. There, on the west side of the street, you will find the Free Box, a creation of Telluride’s counterculture days in the 1970s. Residents drop off things they don’t want and others pick them up with a credo of “Take something, leave something.” Think of it as a wall-size recycling bin, run by the Friends of the Free Box, with its own Facebook page. Now, you’re free to explore Colorado Avenue’s shops and restaurants on your own.